I was once at a gathering of a chapter of the Society for American Baseball Research where we were asked to introduce ourselves and say what player we were fans of growing up. Becoming a Mets fan in the mid-80s, I was taken by the graceful, looping swing and the power — not to mention the name — of Darryl Strawberry. This admission drew at least a few scoffs and looks, all based on the benefit of hindsight 30 years later, after he’d left New York as a free agent (I was disheartened, but not crushed) and seen his Hall of Fame trajectory derailed by drug problems. But when you’re 10, you don’t necessarily pick up on the bad characteristics — not to mention the fact that I didn’t read New York tabloids and we didn’t have the internet. Sure, maybe the wholesome joy displayed by Gary Carter or the steely professionalism of Keith Hernandez might’ve made for more worthy idols, and I tried to walk back my choice a little bit by saying as much. But I was captivated by those towering home runs off the Shea Stadium scoreboard and that one off the Olympic Stadium ceiling. 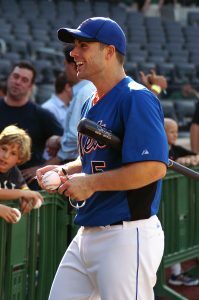 I would have no hesitation, however, in expressing my admiration for David Wright. Enough has been said and written about him over the past few weeks that I don’t need to rehash his attributes, but I can’t imagine a valid argument anyone could make against Wright as a star and role model on or off the field. I’ve followed him longer than any player in my lifetime, beginning in 2001 in the Class A South Atlantic League, and because of that it’s still a little shocking to me that his playing days are over. On the one hand, it’s been that way since he left the lineup in 2016, but now that it’s official, it’s another thing to process. And so, for no other reason than my own personal cap on his career, here are my top (mostly in-person) David Wright moments. This one goes here because I wasn’t there, but it’s probably my No. 1 moment in Mets-Yankees interleague history. Another one I watched on TV. That he would homer in his first All-Star Game at-bat may be what first gave us a hint of this guy’s awareness of the moment. It would also come through in that Citi Field opener and his home run in Philadelphia on Aug. 24, 2015, his first game back after a four-month layoff that season as the Mets were fighting for the National League East title. This wasn’t a David Wright moment, but the image I have of it from my seat in a loge box behind the plate at Shea is one of the best baseball photos I’ve ever taken. Mets manager Willie Randolph rested Wright and Carlos Beltran in this Thursday afternoon affair against the Cubs, but both got into the game in the ninth. Trailing 5-1 entering the inning, the Mets rallied against Ryan Dempster. David Newhan led off with a single, Ramon Castro lined out and Carlos Gomez singled. Beltran pinch-hit for pitcher Ambiorix Burgos and walked to load the bases. A walk to Endy Chavez made it 5-2 and a Ruben Gotay single made it 5-3, still with the bases loaded. Scott Eyre replaced Dempster with the left-handed Shawn Green coming up, so Wright came in as a pinch-hitter and singled to score Beltran and make it 5-4. Up stepped Carlos Delgado, who delivered a two-run walk-off single to start this celebration. Teammates ripping off a player’s jersey after a walk-off hit has become rather common these days, and I first remember it with David Freese and the Cardinals in the 2011 World Series (a jersey I recently saw in the Hall of Fame), but four years before that, it looks like Wright was about to do the same thing. 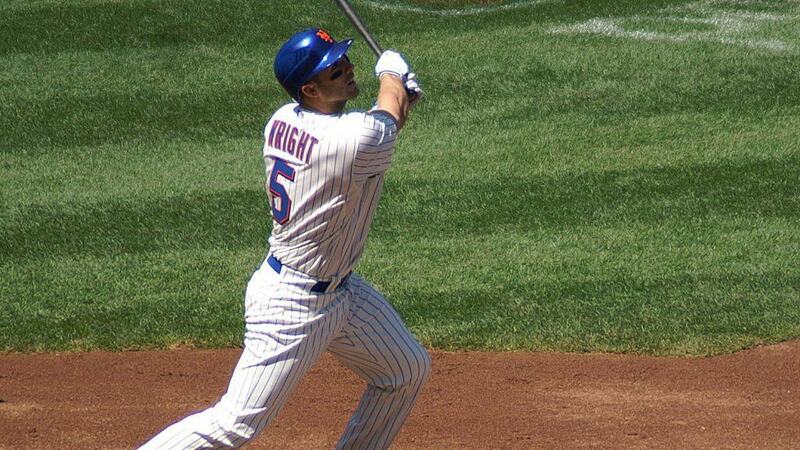 I attended this game specifically to see Wright. He had come up in July, but I didn’t get to any of the games before they left on a road trip. He hit his first three home runs in Montreal, Atlanta and Milwaukee on the 13-game trip. Back home to face the Astros on Aug. 10, he launched his first NYC shot in the seventh off Tim Redding. I covered this game as the local beat reporter for the Lakewood BlueClaws, and Wright finished second in the home run derby to the late Andy Marte. I interviewed Wright afterwards. One of the few Mets records Wright doesn’t hold is walk-off RBIs, because Wilmer Flores passed him this year with his 10th. 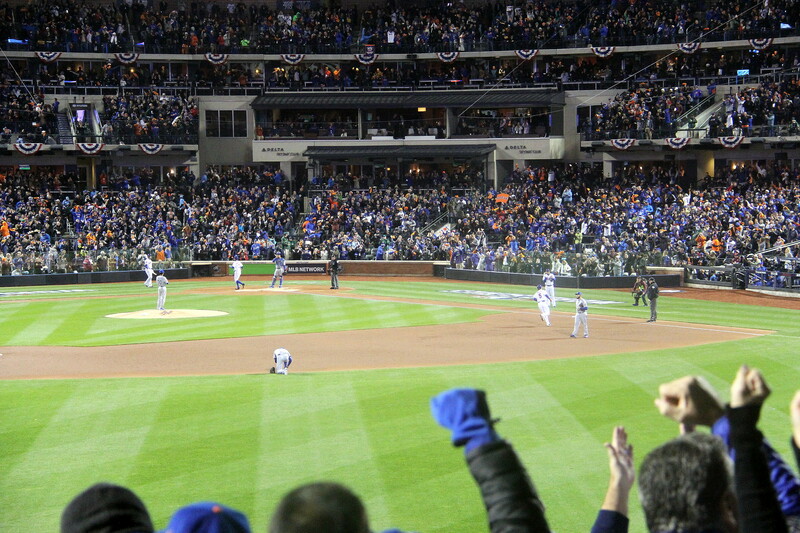 Wright’s nine career walk-offs: sac fly, double, single (off Mariano), single, double, single, home run, single, single. The only home run came on Aug. 7, 2008, against former Met Heath Bell and the Padres. I was at this one — another Thursday matinee — and I remember making a point of staying for the chance of a walk-off hit from Wright. I had the day off and nowhere to be. That it would be his first — and last — walk-off dinger was more than I could’ve hoped for. At a more recent SABR gathering, we were asked to turn to our neighbor and introduce ourselves and share our favorite game we’ve attended. I went with this one, my first World Series game, the only one the Mets won that year, and the third game — and win — I attended that postseason. I got two tickets in left-center field through work and brought my mom, and when this ball was hit and I saw the arc and the speed with which it was growing bigger, I started bouncing and cheering pretty early, confident it was going to carry over the fence. It’s the moment that made Citi Field what it is, because as Will Leitch wrote, “you never really know a baseball stadium until it’s hosted a World Series.” I can’t be sure, but upon seeing the replay of the home run, I think I can see myself among the first people jumping up and down, a moment before the rest of those sitting — standing, at this moment — in the lower level of the left-field seats. I’ve never heard that stadium louder than it was at that moment, and though I wasn’t there for his farewell last Saturday, I can’t imagine it topping this ovation.